Everybody needs time to settle in to a new home, including budgies. Eventually, you might establish a close bond with your new pet – budgies have sociable, affectionate natures - provided you take your time. He’ll probably never appreciate being grabbed and cuddled, but he might become more than happy to jump on your hand. Get the cage ready before you bring your new budgie home. No matter how confident the bird is, moving house is a stressful experience and he’s going to need some peace and quiet for the first few days. For this reason, place the cage somewhere relatively peaceful, perhaps not in the main family room if you have a large and raucous family. Find an old but clean sheet to cover the cage and fill up the food and water receptacles. When you bring your budgie home, transfer him to the cage as quietly and quickly as you can, preferably letting him cross from the carrier to the cage by himself, rather than picking him up. Drape a light-colored sheet over the cage, which will give him a sense of security. Don’t use one so thick and dark that it blocks out all light, which will just make him go to sleep. For the first few days, don’t do anything except for feeding him and changing the water. Keep using the sheet if he seems nervous. Once the budgie appears to have settled into his cage, start getting him accustomed to you. Don’t try to pick him up yet; instead, spend as much time as you can just standing or sitting near the cage and chatting to him softly, about any nonsense you like. If you have work or studying to do, bring a chair over to the cage and do it there. Once he’s comfortable with this, start just putting your hand in the cage. Repeat a few times a day until he stops backing away when you do this. The next stage involves blatant bribery. Note which treats and snacks your pet appears to find the most delicious and start offering them to him in your fingers. If he doesn’t take the treat immediately, wait a minute or so before dropping it and withdrawing your hand. Repeat several times a day until he’s happy to take treats from your hand. To get him to hop on your finger, slowly move your hand towards him, holding your index finger out as a perch. Very gently push your finger against his chest, which should encourage him to hop on. Give him a treat while he’s on your hand or afterward. Eventually, you’ll be able to take him out of the cage. 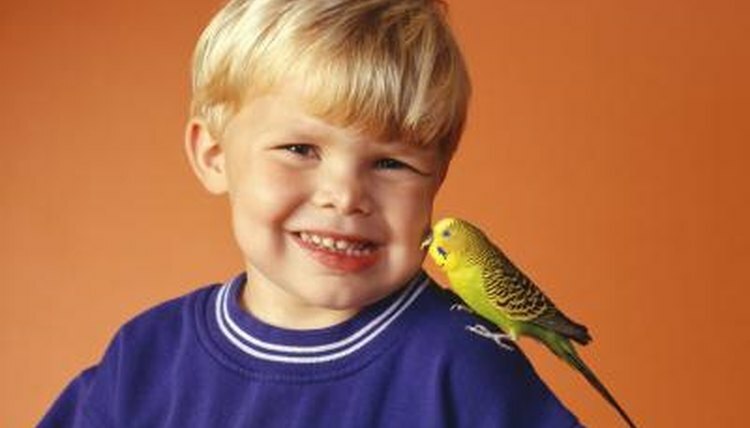 Without a bird friend, the budgie will probably become very dependent on you, requiring constant attention. This might suit somebody who is housebound, but if you are out at work or college all day, he’ll become very lonely. If you can’t be a full-time budgie companion, consider adopting a second one as soon as possible. The younger the birds are, the faster they’ll bond, but you will need separate cages in the beginning.